The command structure of the Macedonian army was extremely complex, consisting of many separate layers of authority. At the highest levels it is quite well known; the same cannot be said of lesser ranks, but there are hints that suggest that, even at its lowest levels, it was as complex as the more powerful positions. As with many areas of Alexander’s empire, and particularly within the army, the command structure was continually evolving as new positions were created and others became obsolete. The most significant changes, however, were probably politically motivated. Alexander gradually changed the army from being that of Philip, through the influence of Parmenio and his family, to being his own, particularly after 331/0, when Parmenio’s influence had been removed. At its lowest levels the command structure of the heavy infantry can be deduced from its gradations of pay. The smallest tactical unit of the heavy infantry was the dekas or ‘file’. As the name implies the dekas had once consisted of ten men, but at some point long before the reign of Alexander it had been expanded to sixteen. Of these sixteen men, twelve were rank and file with the other four being of superior status. Of these four, one was the dekadarch or file leader, one was a dimoirites or half-file leader and the other two were dekastateroi or half-file closers. Arrian tells us that the dekastateroi were paid the equivalent of one and a half the pay of a rank-and-file soldier, around forty-five drachmas a month. The dimoirites received double pay of around sixty drachmas a month. Bosworth seems to have made a slight error in interpreting this passage in Arrian, claiming that there were two dimoiritai and only one dekastateros, but Arrian’s text seems quite clear on this point. The manpower indicated is, of course, paper strength, assuming that each taxis was at full strength. The six taxiarchs appear to have all been of the same rank with none holding superiority. Indeed there was no overall commander of the heavy infantry (excluding the one possible reference in Arrian discussed earlier) as there was for, say, the Companion Cavalry. 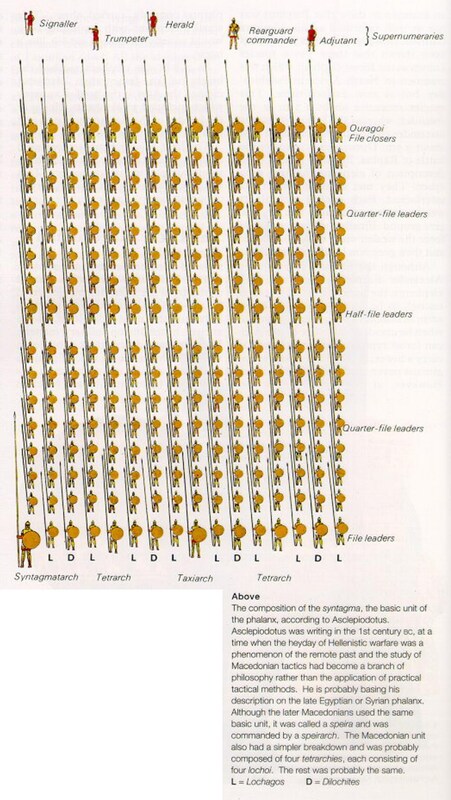 This is because there really was no such organization as the ‘Macedonian phalanx’, the taxeis themselves frequently being used as separate tactical units, or in groups of two or three. This development came largely after 331 when the army entered northeastern Iran and smaller, more mobile forces were required. On the right wing of the attacking force Alexander had the guards’ division under his personal command. In touch with them were the infantry battalions, forming the whole centre of the line and commanded by the various officers whose turn of duty happened to fall upon that day. This is almost certainly evidence of a rotational system within the phalanx. It could be a reference to the order in which the taxeis appeared each day, and we are explicitly told in the sources that that the actual order of each taxis did rotate each day, or it could be that the minor commands within a taxis were rotated to give junior commanders more experience of slightly different roles. The Macedonian heavy infantry appear to have undergone very few serious changes in the command structure over the course of the campaign. The huge numbers of reinforcements received between the great set-piece battles of Issus and Gaugamela seem to have been incorporated within the existing taxeis, presumably adding to the numbers of rank and file rather than to the officer corps. The first evidence for a seventh taxis does not appear until the time of the invasion of India, where Arrian names seven taxiarchs operating simultaneously. At the time of the invasion of Persia, another of Parmenio’s sons, Nicanor, was the commander of the hypaspists. 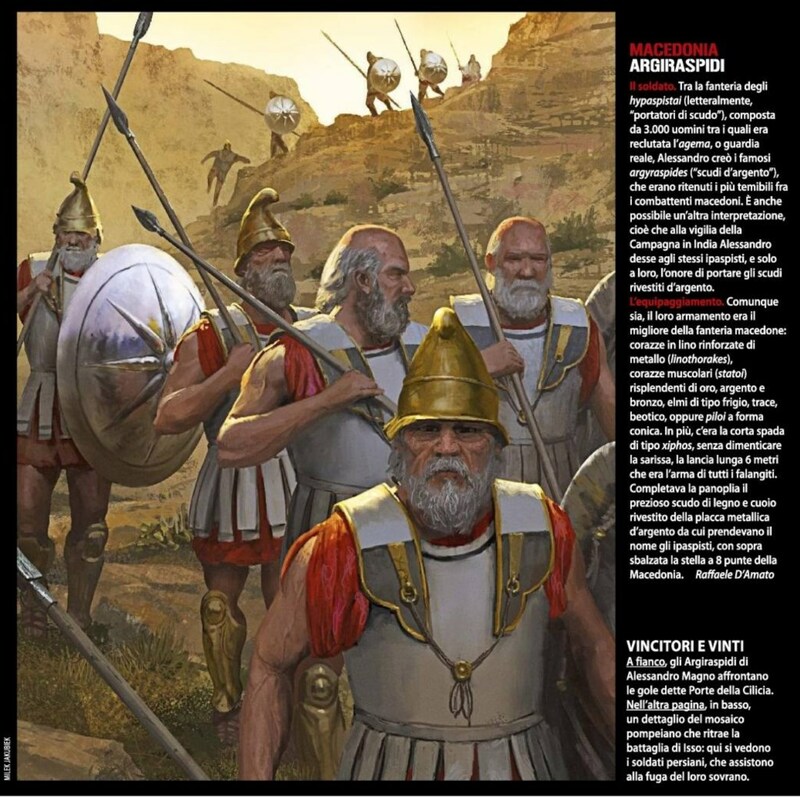 The hypaspists were the elite formation of the Macedonian heavy infantry and their tactical and strategic roles were many and varied. The hypaspists were organized into three chiliarchies of 1,000 men, each commanded by a chiliarch. This is true after 331 at least: before 331 it is uncertain. 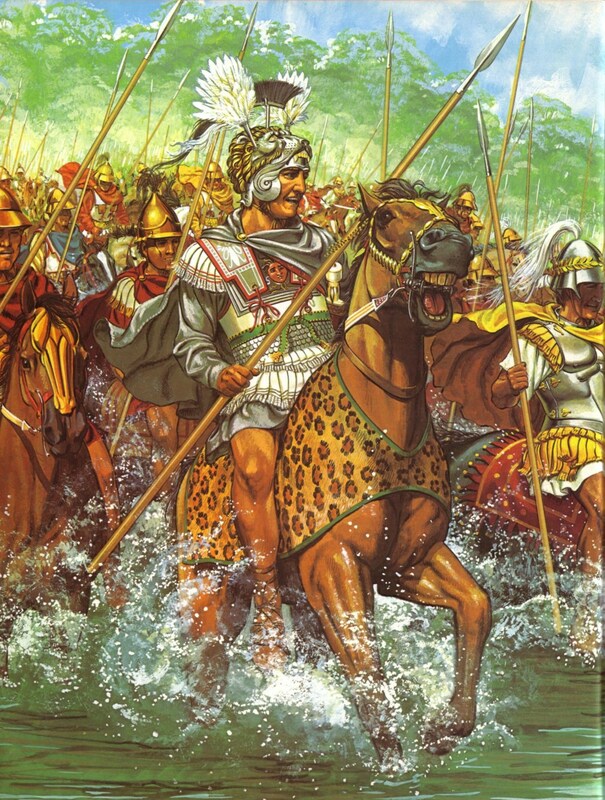 One of these chiliarchies was designated the agema, perhaps commanded by Alexander himself, or more likely by an unknown individual, as Alexander was usually with the Companion Cavalry during set-piece battles. The chiliarchs themselves were of markedly lower status than the taxiarchs of the heavy infantry, being more like a lochagos. This is at first sight rather surprising, considering that the hypaspists were the elite units of the heavy infantry, receiving only the very best of the new recruits into their ranks. We should remember, however, that, unlike the heavy infantry, the hypaspists had an overall commander, Nicanor, who was at a significant level within the command structure, ensuring that their status was considerably higher than that of an infantry taxis. As with the rest of the army, the command structure of the hypaspists was significantly changed at the end of 331. The chiliarchies were subdivided into two new units, pentakosiarchies, thus adding an entirely new layer into the command structure, albeit a very lowly one. These new officers were again appointed by Alexander on the basis of merit rather than seniority, and again owed their allegiance to the king himself. We saw earlier how important this innovation was to the king, particularly later in his career as he became ever more paranoid. The numbers of the Companion Cavalry are not certain, although Diodorus gives the figure of 1,800 and most now accept the figure of 1,800 as at least being very close to the actual figure. We do know that by 333 the Companion Cavalry consisted of eight ilai (squadrons) of 200 men, each commanded by an ilarch. We have no information of from the beginning of his reign, but we do know that along with the general reorganization of the army in 331 an ile was further divided into smaller units. Arrian tells us ‘He also – this was an innovation – formed two lochoi (companies) in each cavalry squadron’. Curtius hints at a reorganization, and confirms that commanders would from this time be promoted on the basis of ability and not of regional affiliations. However he does not mention the division of ile, preferring to concentrate on the hypaspists. From 331 the subdivision of ile was into two hekatostyes of 100 men; there is evidence that each ile was again subdivided into tetrarchia, of which there would have been four per ile. The tetrarchia is only recorded once in Arrian, at the turning of the Persian Gates in January 330, not before or after, but the unit was small enough that this is not surprising as they would mostly have operated in the larger units. One of the ilai was given the title ile basilike, also frequently called the agema, or royal squadron: this unit was also of higher status than the rest. The royal squadron was of double strength and was charged with defending the king when he fought on horseback; they were his personal bodyguard in all of the set-piece battles. The overall command of the Companion Cavalry was in the hands of Philotas – until his execution in October 330, that is. The ilarchs seem to have been relatively minor in rank, probably on a par with an infantry lochagos. Ilarchs are seldom mentioned by name in any of the sources and are never given separate commands of their own. The only one that achieved any level of distinction was Cleitus the Black, the commander of the royal squadron. After the execution of Philotas in 330, the entire Macedonian cavalry was reorganized en masse. The basic tactical formation was now not the ile but the ‘hipparchy’. These new units are first recorded by Arrian during 329. Ilai do still appear in the sources but they become sub-divisions of a hipparchy, each hipparchy comprising a minimum of two ilai and thus 400 men. The ilai were also sub-divided into two lochoi, the commanders of whom were given the title lochagos, as with the commander of an infantry unit. Alexander appointed these commanders personally on a basis of merit rather than superiority, thus breaking with tradition. This was a policy that was entirely consistent with Alexander making the army loyal to him alone. This began to occur some time during 331 BC, probably after Gaugamela, when the last great batch of reinforcements arrived from Macedon. This was the beginning of the policy, that I have noted a number of times, of reducing the army’s ties of loyalty to its individual commanders, ultimately making them loyal to Alexander alone. Thus a new layer of sub-commanders was added in the command structure of the army, one which owed its loyalty directly to Alexander, to some extent breaking the link between the troops and their commanders. There are two possible reasons for this change. Perhaps Alexander came to the conclusion that the ilai were simply too small, at 200 men, to cope with the different style of fighting in the entirely different theatre that was to be their next challenge. The army would no longer be fighting set-piece battles, but would require far more mobility and flexibility as it moved into the northeast of Iran The second possible explanation was a desire on the part of Alexander to increase the relative superiority of the Companion Cavalry over the heavy infantry, each hipparch now being of a higher status than a lochagos. The term ‘ile basilike’ also disappeared at this time and was replaced by the term agema, the nomenclature becoming the same as for the hypaspists. The actual number of cavalry hipparchies is unknown, but it is assumed that there were eight during the Indian campaign. The position left vacant by the death of Philotas was not directly filled. He was instead replaced by two men: Alexander’s life-long friend Hephaestion and Cleitus the Black. Both men were effectively of equal status within the command structure. Arrian gives the reason for this step as that ‘he [Alexander] did not think it advisable that one man – even a personal friend – should have control of so large a body of cavalry’. The Thessalian cavalry were without doubt the most important contingent of this aspect of the army. They were probably equal in number to the Companion Cavalry and very close to them in terms of quality. Overall command of this vitally-important unit was given to Alexander’s second-in-command, Parmenio. The command structure of the Thessalian cavalry was very similar to that of the Companions, being divided into ilai. They were not, however, allowed their own national commanders, but a senior Macedonian officer was appointed to command each unit. The Thessalian cavalry also had a unit which performed the same role as the royal squadron of the Companions; this was known as the ‘Pharsalian contingent’. The other allied cavalry contingents, although considerably less important, were again organized along similar lines, being divided into ilai and each having a Macedonian commander. The appointment of a Macedonian commander at the head of non-Macedonian troops, be they cavalry or infantry, was the general policy of Alexander throughout his reign. Even the mercenary contingents were treated in exactly this same fashion, Menander being their overall commander. These Macedonian officers, however, were relatively unimportant in the overall command structure and few achieved any kind of distinction. The fleets that accompanied the army of invasion were almost exclusively non-Macedonian, being provided by the member states of the League of Corinth. Each ship was captained by a native of the contributing city, and where a city-state provided more than one ship, they also supplied a ‘commodore’ for their particular contingent. As with other non-Macedonian units however, overall command of the fleet was with a Macedonian officer. The term ‘bodyguard’ is quite a confusing one, as there appear to be two entirely separate groups within the army that carry this title. The first is an apparently-quite-strong detachment of heavy infantry. Arrian, three times, tells us that Alexander took with him the bodyguards and some of the hypaspists; this would seem to strongly suggest that they were not simply a detachment of the hypaspists, who were themselves often called ‘the guards’. Diodorus tells us that at the Battle of Gaugamela, Hephaestion ‘had commanded the bodyguards’. This passage again strongly suggests that we are not here talking about a detachment of the hypaspists, as at this time Nicanor was still their commander and only died later that same year. The bodyguards seem to have been a relatively minor force, perhaps of the order of a couple of hundred strong. The relative position of their commander within the overall command structure of the army is unknown; the only commander named is Hephaestion at Gaugamela, who was of course a very senior figure. Hephaestion’s seniority probably had more to do with his closeness to Alexander than the importance of the bodyguards as a military force: his successor after Gaugamela is never mentioned, for instance. This group could well represent a carry-over from a much older organization that pre-dated Philip’s reforms. The group that most interests us here are the somatophylakes basilikoi, or ‘royal bodyguard’, originally seven strong, this number being rigidly maintained. The number was probably connected to their historical function of guarding the king’s tent. They were increased to eight in India, however, when Peucestas was promoted to this rank as a sign of gratitude by Alexander for saving his life during the attack on the capital city of the Malli. The bodyguards occupied a position within the command structure that is difficult to define. The group as a whole formed part of Alexander’s immediate entourage, and seem certain to have been among his closest friends and most-trusted advisors. Membership of the bodyguard was obviously incompatible with any post that involved their being away from court for any length of time: both Balacrus and Menes were replaced as soon as they were assigned to the command of provinces. For reasons that seem less clear, inclusion within the bodyguard was also incompatible with a command within the army. Before Gaugamela, there is no recorded instance of a member of the bodyguard simultaneously holding a senior command. Bodyguards are occasionally reported briefly holding minor commands, such as Ptolemy, who commanded a joint force of hypaspists and light infantry during the siege of Halicarnassus, but this was rare. If any bodyguard were promoted to a senior command, he would immediately lose his title and be replaced. This happened, for instance, when Ptolemy became a taxiarch (this was not the famous historian and son of Lagos, but another very obscure individual: Ptolemy was a very common name in Macedonia). As a group they probably enjoyed the same status as a taxiarch, but did not, as such, occupy any position within the command structure. They were, however, still influential as they were among the king’s closest advisors. This rather rigid system which applied to the bodyguard, as with almost everything else in the army, evolved considerably over time. After the death of Parmenio we hear of instances of bodyguards receiving senior, albeit temporary, commands. In 328, for instance, Alexander left four taxeis of heavy infantry in Bactria, along with their commanders. The remainder of the army was then divided into five columns, three of which were commanded by known bodyguards. The deaths of Parmenio and Philotas represent something of a watershed in Alexander’s career, as will be discussed below. One of the major changes that occurred in the command structure over the course of Alexander’s reign was that the cavalry commands became increasingly important, relative to their previously-equivalent infantry commands. By the time of the death of Philotas Alexander was becoming increasingly disinclined to place such large numbers of men under a single commander; with this in mind he divided the command of the Companion cavalry between Hephaestion and Cleitus the Black. Individual hipparchs also became increasingly important in their own right, becoming roughly equal in status to the position of an infantry taxiarch. At the beginning of the invasion of India, the commanders of the heavy infantry who were most highly favoured by Alexander were promoted to command hipparchies of Companion Cavalry; namely Perdiccas, Craterus and Cleitus the White. This again illustrated that moving from an infantry command to that of cavalry was considered a promotion. During this process, the royal bodyguard evolved into an important position within the command structure. Perdiccas was promoted to a hipparchy, from a taxis of heavy infantry, in 327; by 330 he also had the title of bodyguard. This was a dual function which was also enjoyed by Alexander’s favourite, Hephaestion. The Peithon who was a bodyguard by 325 is very probably the same Peithon who is attested as a taxiarch in 326/5. An infantry command was rare, however; members of the bodyguard were usually given commands within the Companion Cavalry, in alignment with its increasing importance. This desire on the part of Alexander to systematically downgrade the relative importance of the heavy infantry can perhaps be attributed to the fact that Alexander saw them as a potential, and increasing, problem. It was from the ranks of the infantry that the mutinies at the Hyphasis and Opis had come, and it would not be surprising if Alexander had deliberately aimed at increasing the prestige and importance of the cavalry relative to the infantry. This would have been to re-establish the situation that had existed before his reign, where the cavalry were clearly the units of greatest prestige. It is also likely that the heavy infantry had become less prestigious, simply because the army was engaged in northeastern Iran at this time and they were not as heavily involved in the fighting as they had been during earlier campaigns. From 330, when Alexander entered the northeast of the former Persian Empire, he was faced with an entirely new situation: that of guerrilla warfare. This led to a willingness on the part of Alexander to divide his force, seemingly indiscriminately, between various commanders. Before this time if a second column was required it would consist of allied and mercenary troops, the Macedonians almost always staying with the king. As mentioned above, in 328 Alexander left four taxeis of Macedonian heavy infantry in Bactria and divided the rest of the army into five groups. These new commands were given to a fairly select group of Alexander’s closest friends: Craterus, Hephaestion, Coenus and Perdiccas were usually the first choices, with Ptolemy, Leonnatus and Peithon used where more columns were employed. When Alexander entered India, Hephaestion and Perdiccas were sent ahead to the Indus with a large force comprising around half of the Macedonians and all of the mercenary infantry. One of the most important features of the changes in the command structure of the Macedonian army towards the end of Alexander’s reign was the increasing mobility of commands. Individual generals still kept their titles, but were expected to command entirely separate units as situations presented themselves. For example, in 327 three taxiarchs, Meleager, Attalus and Gorgias, were detached from their taxeis and were given the commands of a group of mercenary cavalry and infantry. They were then employed on diversionary movements along the river banks. Another example is that of Coenus, a taxiarch since 334, who was employed as a cavalry commander at the Hydaspes. This move towards an increasing mobility of command was for two main reasons, the first being military. As Alexander entered the next phase of the campaign after 331, he increasingly met with an enemy that operated on significantly different lines from that faced early in the campaign. He was also faced with fighting in a new theatre and in different conditions, all of which required the army to be considerably more flexible than it had previously been. There is surely a second, and in my opinion significantly more important factor at work here: namely politics. Alexander seems to have been becoming increasingly concerned about assigning large bodies of troops to a single commander indefinitely: there was for instance probably no overall commander of the heavy infantry, and the positions vacated by Parmenio and Philotas were never filled, the Companion Cavalry receiving co-commanders. Alexander increasingly detached individuals from their commands and gave them different assignments. He also employed new layers in the command structure and made promotions according to merit. These changes had a two-fold effect: the commanders became loyal primarily to him, since they owed their positions directly to the king’s favour; secondly, the focus of the army s loyalty was also the king, as their commanders often changed and their territorial origins slowly eroded. Alexander made himself the sole focus of every individual, whatever his rank, within the army. Parmenio was probably the single most important political figure in Macedonia, apart from the king, during the reign of Philip; this is true of the early part of Alexander’s reign too. He, as well as various of his family members, was well entrenched at court and seems to have had political connections with both factions contending for the succession in the last years of Philip’s reign. Thus when Philip was assassinated, Parmenio was in a prime position to act as king-maker. He was in a position to offer the support of most of the lowland barons; this would leave Amyntas or any other potential rival with only the possibility of forming a coalition of the fringes of Macedonia and rebellious Greek cities. Parmenio was evidently a skilled political operator and knew well the strength of his position; Alexander was forced to pay a heavy price for Parmenio’s support, but in 336 he was in no position to argue. When the Macedonian army crossed the Hellespont into Asia almost every key command was held by one of Parmenio’s sons, brothers, or some other kinsman. We have already noted that two of Parmenio’s sons were commanders of the hypaspists (Nicanor) and the Companion Cavalry (Philotas), with Parmenio himself commanding the Thessalian cavalry and essentially being second in command of the whole army. Parmenio’s brother, Asander, probably commanded the light cavalry, and certainly received the satrapy of Sardis as soon as it was conquered. 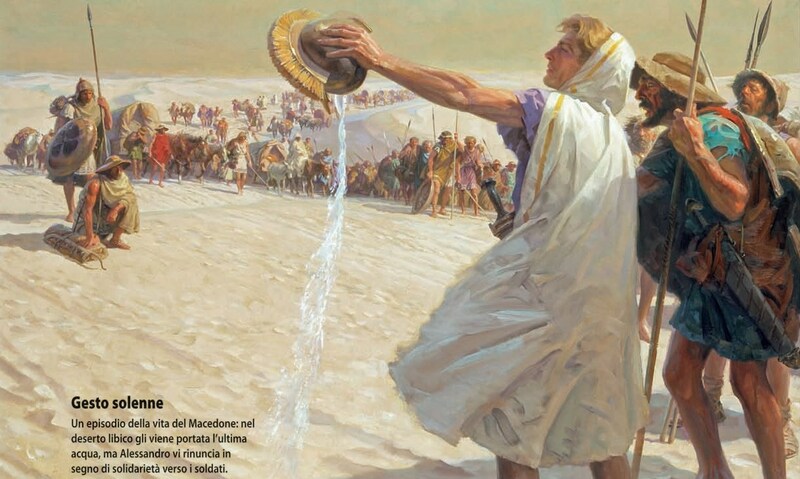 Parmenio’s supporters were also firmly entrenched in positions of power, men like the four sons of Andromenes and the brothers Coenus and Cleander. Many of the commanders of the army of invasion were little younger than Parmenio himself: when Justin tells us that headquarters looked ‘more like the senate of some old-time republic’ he is probably not exaggerating in his description, although it is a far from flattering one. The Macedonian army down to 330 was at its very core Philip’s; they were his veterans and his commanders. Philip’s influence was always present, and frequently felt by Alexander in the form of Parmenio. This was a situation which Alexander could not tolerate indefinitely. He allowed the command structure to remain relatively unchanged whilst his success was still in the balance, but after Gaugamela Alexander began to make serious and sweeping changes to the army, changes which were made considerably easier by the assassinations of both Philotas and Parmenio. Some authorities have argued that Alexander was plotting for the best part of six years to remove Parmenio’s grip on the army, and see the final execution of Parmenio and Philotas as being the culmination of this plotting; this seems unlikely to be true. Why would he, for example, have left Parmenio in Ecbatana with a considerable part of the army and his treasury if he did not trust his loyalty, or if he was about to act against him? Alexander, on the whole, seems to have been more impulsive and spontaneous than this theory would give him credit for: it is more likely that Alexander seized his opportunity without having engineered it. Alexander was gambling that the army loved him more than they loved the old general, and he was right. Although the Thessalian cavalry perhaps did not take it well, they were not a significant part of the army after this, and indeed were disbanded entirely soon after. Following the death of Parmenio, Alexander would never again allow large bodies of troops to be commanded by any one individual for any length of time. Dissention was met with ruthlessness; the army had at last become his and his alone. This entry was posted in Ancient Warfare, Armies by MSW. Bookmark the permalink.